Not many 41-year-old quarterbacks can finish a season with five losses and have fans and media calling it “uncharacteristic.” Yet, New England Patriots‘ quarterback Tom Brady has been so efficient for so long that a couple more interceptions, fewer touchdowns and his first season with fewer than 12 wins since 2009 must mean he’s slowing down. Either way, Brady and a much-improved secondary from a season ago are leading a dangerously well-rounded team into postseason play. A secondary that comprises young hidden gems such as undrafted rookie cornerback JC Jackson and third-year cornerback Jonathan Jones — who also went undrafted — in combination with proven veterans Stephon Gilmore, Jason McCourty and Devin McCourty has taken some pressure off a regressing Brady. Note: By Brady’s standards, a 90.7 overall grade (fifth among quarterbacks) is a regression. It would be his worst grade since 2014 — that’s how good he’s been. But Brady’s five games with a grade of 70.0 or lower in 2018 is the most he’s had in a regular season since 2014 — and even so, three of those performances resulted in wins. Much of that credit belongs to a revamped secondary that is shutting down opposing receivers. The Patriots are one of two teams with two cornerbacks who have played 200 or more snaps and have allowed a passer rating of 75.0 or lower. 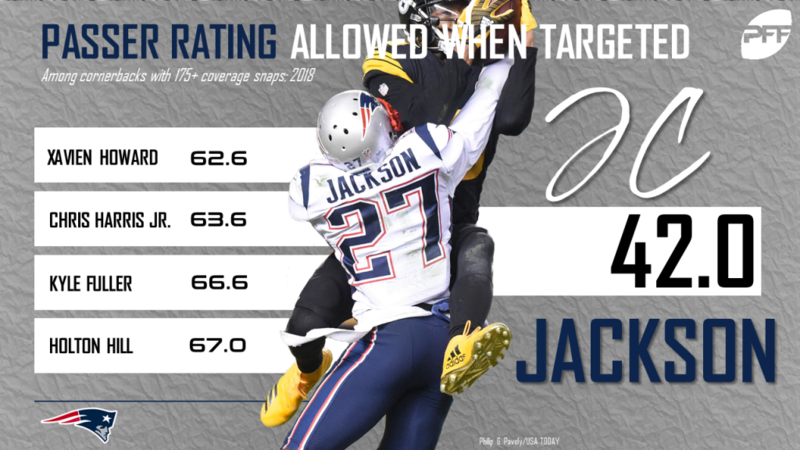 Jackson is allowing a 42.0 passer rating in coverage — including no touchdowns and three picks — and Gilmore has a 71.8 passer rating allowed in coverage while holding his matchups to just a 46.7% catch rate (second among cornerbacks). Jackson’s final three games of the regular season cemented his status as a player to watch in the postseason, as he locked down Pittsburgh Steelers wide receiver JuJu Smith-Schuster, played 45 coverage snaps against the Buffalo Bills without facing a target (garnering an 88.4 overall grade) and allowed just 49 yards on seven targets against the New York Jets. He provided even more consistency in tackling, where he owns the most snaps among cornerbacks who haven’t missed a tackle. But what’s been most impressive about the rookie stud is his ability to track the deep ball. On 14 targets of 20 or more yards, he’s allowed just one completion to go along with three interceptions — a 0.0 passer rating allowed. Few rookies, let alone undrafted ones, can adjust to the NFL’s speed as quickly as Jackson has. Jonathan Jones has found similar success on deep passes, and it’s no surprise given his 4.33s 40-yard dash back in 2016. He’s allowed just one completion on eight targets of 20 or more yards, including two interceptions. If playoff teams think they’ll be getting free deep shots against the Patriots’ young corners, they are very mistaken. And lucky for Jackson and Jones, they’ve been able to learn from proven defensive backs on their own sideline. As the top-graded cornerback in the NFL, Gilmore is having the best year of his career — a much-needed contribution from the seven-year veteran in a season where the Patriots offense hasn’t quite looked itself. His 90 targets are the 11th most among cornerbacks and just two shy of the most in his career, yet he’s having career-bests in catch rate, yards allowed, yards per reception, yards allowed after the catch and pass breakups. Jason and Devin McCourty have posted overall grades of 83.1 and 78.4, respectively, and have provided strong tackling grades each over 80.0. In combination with their younger counterparts, the McCourty twins round out a secondary that owns a second-best 92.7 coverage grade. No team has contested more deep passes than the Patriots’ 38, and no team has contested more passes overall than the Patriots’ 110. Tom Brady is still playing at an elite level, but New England may just have to rely on its secondary in crunch time this January (and potentially February) — and that unit has proven its more than capable of getting the job done.